In a climate where hunting is a cherished right associated with dominion over animal-kind, hunting is passed down from one generation to the next, sometimes as a religious rite of passage. 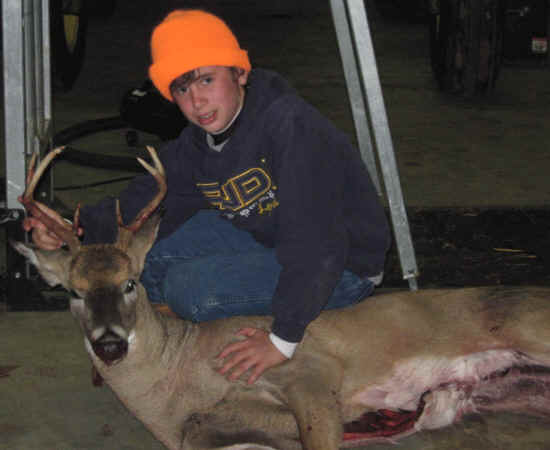 Even young children who still want to stroke a deer rather than shoot him, are taught to hunt and kill. Too often this terrible violence, both to the well-being of the child and the animal victim occurs in a religious framework. This child is petting a deer who has been killed at a Christian Youth Hunting Ministry camp, designed to bring children closer to Jesus. He is young enough that he still wants to caress the deer. Instead he was made to witness and perhaps even participate carrying out the dictates of Christian doctrine towards animals. He looks as if he is trying not to cry. His compassion has been dampened, as he must put on a brave face. The damage done to the deer is clear. The harm done to this child, though not a visible, will take its toll, for he has learned he has the divine right to kill the weak and defenseless. Such brutality to children and animals is allowed for it serves a presumably greater purpose: The Outdoor Mission Camp was created to bolster up Christian membership, by bringing participants closer to Christ, as it destroys compassion in children and violates innocent animal lives. Founded by Ruffin and Jamie Shackelford in 1998, Outdoor Mission Camps fulfills a life long preparation to lead youth to Christ through a Christ centered wilderness experience Through the marvelous grace of God, Ruffin turned his life to Christ after witnessing the majesty and awesomeness of His creation. Jamie surrendered to the Lord after facing various challenges in life. However, both of them grew up loving the creation as they backpacked, paddled, hunted and fished while spending time with their fathers in wilderness settings." 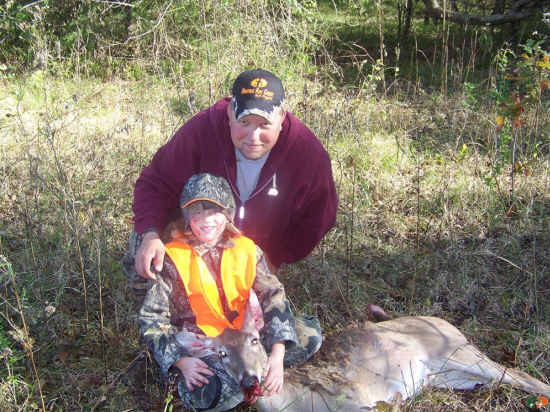 The well-being of a child and the life of a deer may be sacrificed to the lofty goal of recruiting converts. The excuse sometimes given that children must learn gun safety, quickly turns into an oxymoron when they are taught to kill:. Even more conflicted is that the 'majesty and awesomeness of His creation' is celebrated by traumatizing children and killing animals. This perverted display of awe, despite 'loving the creation', is made possible by the Judeo-Christian view of animals: they may be used or killed for a higher cause to benefit man: in this instance increased fellowship and membership to fund and support religious institutions. “Outreach Outdoors is a Christian hunting ministry aiming to spread the message of Jesus Christ to non-believers and challenge Christians to live a life of purpose” A life of purpose to build up membership, based on violating the sensibilities of young children and killing defenseless animals is questionable, though both are permitted within the constraints of dominion. Ideally religion deals with the spiritual realm, but when the goal is political dominance, then it is necessary to entice recruits with the carcass of an animal. "The organizers' primary goal for hosting the event was to familiarize the youngsters with gun safety, in addition to spreading the word of the Gospel. Almost three dozen children from San Angelo, Miles, Rowena, Eldorado, Wall, Miles, Christoval and other area towns attended the event. San Angelo teenager Joey DeLoach said, "I think that there are some kids here who aren't Christians and so I like that aspect of it, to bring these kids closer to Christ. I like that very much." "There's so many kids that need to hear the word about Jesus Christ and who also need the hunter safety course. You've got to get outside the church to get across to most of these people."